El Haj T'hami el Mezouari el Glaoui – better known as “Lord of the Atlas” or “Pasha of Marrakesh” from 1912 to 1956 – decided to have a golf course constructed near the city of Marrakech and so he called in French professional Gustave Golias to set up a small 4-hole course for his personal use in 1927. This was expanded to a 9-hole layout the following year. The Pasha obtained land cheaply during droughts and one such parcel of property was irrigated and fashioned into a private 18-hole course, much to the dismay of the French colonial rulers at the time. Their protests were quickly placated of course as soon as playing rights were granted to their top government officials! French professional Arnaud Massy, the first non-British winner of the Open in 1907, is credited with remodeling the course at Royal Marrakech in 1933, along with Gustav Golias (who was by then the Pasha's personal pro) and Bouchaib Stitou. Today, the cypress, eucalyptus, palm, and olive tree-lined fairways are largely unchanged from those distant days. A raft of new courses have appeared around Marrakech in recent years but many still rate the charming old layout here (extended to 27 holes by Thierry Sprecher in 2007) as the best of all. And why shouldn’t many golfers prefer to stride these fairways, following in the footsteps of Churchill, Lloyd George and Eisenhower, all of whom were eminent golfing guests of the Pasha? The club is fortunate to have its own water supply, provided by the authorities, and this flows through the property at certain times of the week in special channels, allowing the trees flanking many of the fairways to remain in prime condition. In recent years, floodlights were added to the Menara nine-hole circuit and this rather extravagant facility now lets the club host evening golf competitions on special occasions. I’m not sure what earlier reviewers were looking for when they played here. It’s really hard to compare an old-fashioned design like Royal Marrakech with any of the new courses that have sprung up around the Red City in recent years so if you come here looking for something similar then you’ll be sadly disappointed.If, on the other hand, you’re looking for a veritable golfing oasis in the desert, with dense, tree-lined fairways and not a hint of any residential development within or surrounding the property, then this is the place for you. future. The club is also around halfway through the complete rebuild of the old 4km stone wall surrounding the 250-acre site so there’s another example of the upgrading that’s going on to improve the infrastructure. The pick of the holes on the main 18-hole Old course are the 1st on the Vert nine, a gentle 425-metre par five that plays to a tightly bunkered, slightly raised green (as found at many of the holes) and the 169-metre 9th on the Rouge nine. This is the famous “Brigitte Bardot” hole, where the flag can be seen through the "cleavage" of two protecting mounds on either side of the green – it’s an iconic hole that really has to be seen to be believed! The 481-metre 5th on the Menara (Blue) nine is regarded as the best on that circuit and it sweeps left past an old water pumping station that Marc hopes to develop into a small museum, exhibiting old golfing artefacts from the club’s historical past. I really think it’s worth taking a step back in time at Royal Marrakech. There’s a really relaxed vibe to the place and the hustle and bustle of the nearby city seems a million miles away within its arboreal confines. For me, this is a must visit venue, even if it’s just to see where some of the more modern designs around the city might have learned a thing or two. Don't be fooled by use of the word 'Royal' in this golf clubs name - it doesn't mean a club with a noted history and now striding forth as a wonderful place to play. It would closer to describe it as a faded relic of yesteryear.This may have been the first course in Marrakech, but it's now one of six, with at least one more in early developemntal stages. Unfortunately for Royal Marrakech, all of the newer courses are better. When you've played at Amelkis, Palmeraie, Al Maaden, Assoufid and Samanah and you still want to play more golf, go back and play them all again. If you still want to play some more, then try Royal Marrakech.The holes are mostly straight, all tree lined and after about the third on any of the nines, they become quite forgettable. The green fees are about 500 (or 550) MAD which is close enough to 50 Euros and is about the same price as the other courses. Compulsory caddies are another 100MAD. The clubhouse was quite nice and the staff friendly enough but as a visitor it's all about the course design, conditioning, aesthetics and playability and in those regards there's nothing worth telling.Although this course (as at Dec 2010) is listed as number 5 in Morocco it only has that position because there are only five of the countries courses listed. If and when other courses are added it surely must remain ranked last. Just got back from Marrakech and had the displeasure of playing Royal Marrakech. Its in a terrible condition with 9 holes closed.I have never in 40 years payed a course as bad as this. Just played this course and apart from the"Bridget bardot par 3" I cannot remember a single hole, every one seems exactly the same. Don't get me wrong the course is very pretty with all the trees and shrubs etc but every hole is straight with a few bunkers left and right with the exception of about 4 holes which are either par 3's or have a slight dogleg. All in all It was incredibly boring, try Amelkis down the road, much better! 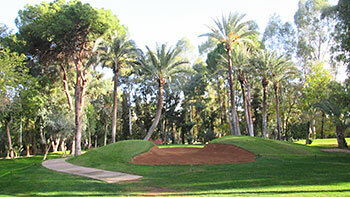 Royal Marrakesh actually comprises three 9 hole loops and the different combinations are each named. I played the Menara after I was able to persuade my wife that she should spend a morning by the pool! The facilities are all a little run down and everything seems a little dejected; there is no real atmosphere at the club. Costs started to mount somewhat as I had to hire clubs, shoes and buy balls, tees and a glove (which was second hand and in pretty poor shape!). I was also required to take a caddy, even though I was happy to carry my own sticks. Not all that unusual in this part of the world. Unfortunately my caddy was dour and disinterested and tried to convince me that for every birdie I should buy him a bottle of champagne…funny for the first two birdies – not so much after three and two eagles! Unfortunately his persistence paid off and I ended up tipping him far more than he was worth.The course itself was pretty simple with wide fairways, gentle bunkering and big greens but there were a few holes of note. The first couple of holes are pretty boring but the course gets going at the par 5 4th: a slow dogleg left which requires a good drive and an accurate second. The drivable par 4 9th is just too tempting not to take on (I got an eagle after sinking a 9ft putt!) and the last four holes off a good(ish) finish. Would I go back? Probably not. The Amelkis course, which is just next door to Royal Marrakesh, is apparently a better test and the course is in better shape.